Send a Fun Halloween Candy Gift, and We’ll Include a Free Greeting Card! Halloween Candy Gift Tin: This frighteningly fresh and fun reusable tin is stuffed with a Halloween mix of treats. Custom Candy Bar Box: Pick 24 candy bars! Movie Theater Candy Gift Tub: 10 boxes of yummy movie theater candy in a plastic popcorn tub. 9” Gummy Pizza: A pizza made of everything gummy inside an authentic cardboard pizza box. Star Wars Crystal Pez [Limited Edition! 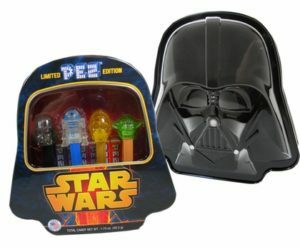 ]: Star Wars character Crystal Pez in a Darth Vader tin.